Leading Australian kart team Patrizicorse has confirmed it will enter a team in the 2018 CAMS Jayco Australian Formula 4 Championship. Team founder and former Supercars driver Michael Patrizi visited the Formula 4 paddock at the Gold Coast 600 to launch the team’s arrival. “I’ve kept a close eye on the championship since its inception a couple of years ago, and as a team we feel ready to make that next step into Formula 4,” Patrizi said. CAMS General Manager of Motor Sport Michael Smith was also onhand to welcome Patrizi to the championship. 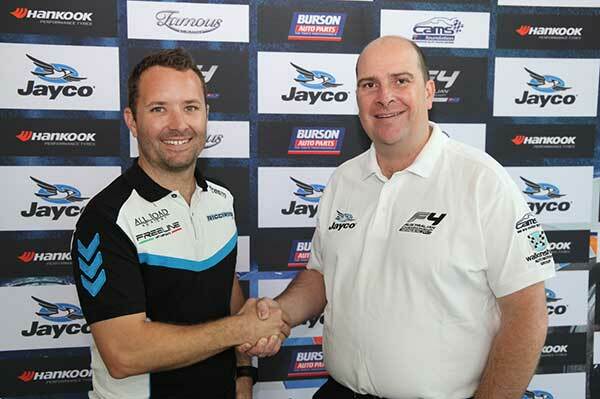 “It’s a great endorsement for our category to have one of Australia’s top karting teams join the CAMS Jayco Australian Formula 4 Championship,” Smith said. Patrizi also confirmed the squad has purchased a car outright and signed a driver, to be named at a later date, with the intention of running a second car. The Queensland based squad was established in 2012 and has since become a powerhouse in Australian and international karting competition. Alongside its strong karting pedigree, the squad is no stranger to circuit racing with Patrizi previously competing in the Porsche Carrera Cup Australia series in 2014. The arrival of Patrizicorse expands Formula 4’s suite of teams to five, including the likes of AGI Sport, Team BRM, JRD and Zagame Autosport.